Operation of modern-day technology requires an ever-increasing use of broadband frequency signals. This, in turn, has grown the demand for reliable, efficient methods of signal transmission that prevent interference and are more efficient in their use of the scarcely available frequency spectrum. These requirements are constrained, however, by reciprocity—a law of physics that forces the transmission of light to be identical in opposite directions. In past decades, scientists and engineers have addressed these challenges with the creation of isolators: devices that use an external magnetic field to force light waves to travel in a single direction. But this form of wave isolation is costly, and it requires the use of large, heavy magnets that demand a lot of device real estate. An additional drawback is that they cannot be integrated into silicon-based circuits and systems. In the cover-story paper published in today's Nature Electronics, researchers at the Advanced Science Research Center (ASRC) at the Graduate Center of the City University of New York (CUNY) and at the University of Texas at Austin detail the development of a new light wave-isolation method that may overcome these challenges. The innovative approach does not require magnets or any other form of "external bias" for reliable wave transmission, yet it ensures highly efficient broad bandwidth isolation. 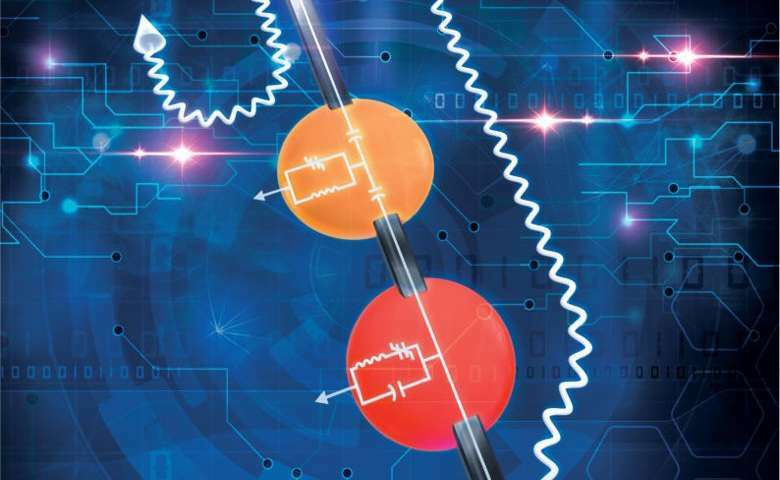 "We have been working on overcoming reciprocity without magnets for a few years," said Andrea Alù, director of the ASRC's Photonics Initiative and Einstein Professor of Physics at the Graduate Center. "In the past we have explored using devices with moving or time-changing elements, but these approaches pose other technological challenges. In this paper, we show that a non-magnetic device free of an external power source—thanks to suitably tailored nonlinearities—can dramatically break transmission symmetry and realize efficient broadband isolation." In their paper, the researchers explain why previous attempts to use nonlinearities to induce isolation faced poor performance. Alù and his team show that any system based on a single nonlinear resonator to isolate waves is inherently limited by a quality trade-off between level of isolation, bandwidth, and insertion loss, making any such device poorly performing and impractical. In their most recent experiments, the team has been able to overcome and address this problem using two judiciously designed nonlinear resonators connected through a delay line, showing that this is the minimal configuration for enabling low-loss one-way transmission over a broad bandwidth. The combined components, which were printed on a circuit board, formed a highly effective, fully passive isolator that provides excellent signal integrity. "Our breakthrough was in realizing that the poor performance of all past attempts to build nonlinear isolators resided in a limitation stemming from time-reversal symmetry, and that we need to find a way around this challenge," said Dimitrios Sounas, lead author of the study and research scientist at the University of Texas. "Surprisingly, when two nonlinear resonators are carefully designed and coupled together, one can achieve the best of both worlds: full transmission and infinite isolation." The team anticipates the findings may find use in a variety of technologies, including consumer electronics, surgical lasers, automotive radar and lidar systems and nanophotonic circuits and systems. The next stage of research will investigate a variety of approaches to fine-tune the functionality of the isolator, including potentially adding additional types of nonlinear resonators to realize circulators and other multi-port devices. What? Light Transmitted, received, reflected, controlled by magnetic fields? Are talking about light transmission or charge transmission? Anyway, each point source produces a tiny spherical wrinkle due to oscillation, moving relative to the center of that oscillation apparently at Lambda Nu initially. We'll get back to the accordion, c; but set your Theoretical Isomorphic Space, with each dimension equal to lambda. This to set your thinking, i.e. wave motion, everywhere, updated, in simulation and view. Since each field is unique, apply superposition [Model] derived or enumerated! With a decent computer, you should be able to identify every possibility, obtainable and unattainable in a give space and time! Charge and the field are the same thing, i.e. "charge" is the center of the field. The Field and the charge are never destroyed. What you call energy, is simply the wrinkle in the field, you never put a fire out! You simply cease transmission. Or, Chill! The Fields are unique! .. and immortal and indestructible! So describe your light propagation experiments upon this reality! Might add clarity! Always specify the media. In other words, is it possible to control a nonlinear media? Yeah! Create logic gates, ... anything can be used that can be defined and calibrated; fabrication left as an option! However, I thought about a modulated magnetic field, i.e. modify velocity of charges. The signal is written in nanoseconds upon a stream that radiate simultaneously, the decoder is sent factorially over the frequency spectrum, infinite bandwidth, how sharp is our impulse function? Don't need all 'dat, signal applied locally. Holographics? From the article: "In past decades, scientists and engineers have addressed these challenges with the creation of isolators: devices that use an external magnetic field to force light waves to travel in a single direction"
Funnily I remember someone asking about if light could be controlled by magnetic fields over a decade ago in a Google discussion group and the answer was some kind of flame war about how the asker knew nothing about physics. Looks like something like that has been done for decades according to this article.